Great Britain's men enjoyed a successful day in European qualifying for the Rio Olympics as six fighters made it through to quarter-finals. 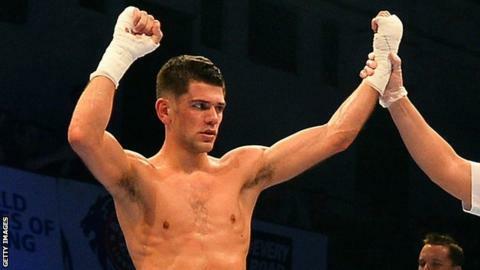 There were wins in Turkey for lightweight Joe Cordina, of Wales, and middleweight Anthony Fowler. Bantamweight Qais Ashfaq progressed despite a head cut against Merab Turkadze of Georgia. Joshua Buatsi (light heavy), Cyrus Pattinson (welter) and Lawrence Okolie (heavy) completed a clean sweep. European champion Cordina won on points against Miklos Varga of Hungary before Fowler won in similar fashion against Moldova's Valeri Sirbu. Ashfaq saw his fight stopped in the second round due to a head injury, but he continued to beat Merab Turkadze of Georgia. On Wednesday, 11 GB boxers are in quarter-final action, including Olympic flyweight champion Nicola Adams. The only remaining British woman in competition, she fights Sarah Ourahmoune of France. The top three men in each weight category win Olympic places for their country at this summer's Games in Rio. In the women's events, only the two finalists are given Rio places.